TT's Commonwealth Youth Games 2021 bid team Rheeza Grant, left, Kwanieze John, centre, and Chanelle Young, right, with members of the Commonwealth Games Federation evaluating committee in Trinidad earlier this week. THE local bidding team is feeling confident that history will be created, following a two-day visit to this country by officials from the Commonwealth Games Federation to evaluate this country's suitability to host the Commonwealth Youth Games 2021. TT is vying with Gibraltar for hosting rights for the 2021 Games. 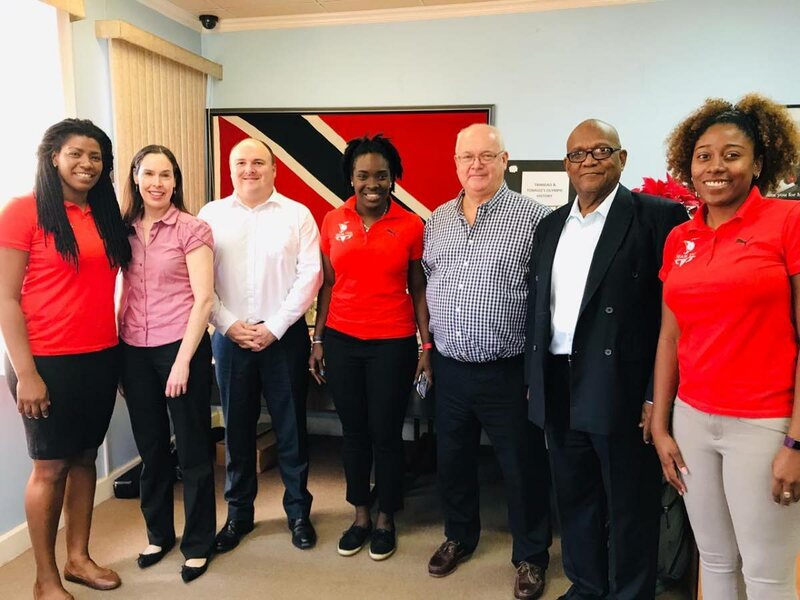 The TT Commonwealth Games Association's bidding team comprised an all-female cast of national rugby player Kwanieze John, TT Olympic Committee (TTOC) project officer Rheeza Grant and TTOC's marketing and communications officer Chanelle Young. Visiting TT were Rachel Simon, head of the Commonwealth Youth Games; chief operating officer Darren Hall; Commonwealth Games England sport director Don Parker; and Keith Joseph, the secretary general of the St Vincent and Grenadines Commonwealth Games Association. The venues visited were the Hasely Crawford Stadium (Mucurapo), National Cycling Centre, National Aquatic Centre (Couva) and the National Racquet Centre (Tacarigua). She continued, “Our emphasis is on empowering youth and young people of the Commonwealth coupled with our world-class facilities, we think the Commonwealth Games Federation has a tough decision in awarding the bid." TTOC president Brian Lewis said he was pleased with the team's efforts to not only be professional and thorough but also be convincing. Lewis said it was no coincidence that a young group led the bidding for TT. The TTOC boss believes this was a historic moment in the country. “I cannot remember TT has ever been at this stage to host an international and multi-sport event; this can be a catalyst for youth sports and sport tourism in TT,” he said. The Commonwealth Youth Games will consist of nine sporting disciplines including E-Sports and BMX. Reply to "‘Tough decision’ for 2021 C’wealth Youth organisers"